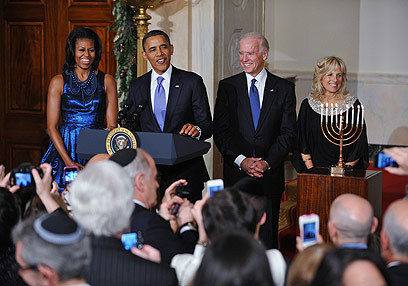 US President Barack Obama held a festive Hanukkah reception at the White House on Thursday and appeared to be in a particularly cheerful mood. Among the guests were his wife Michelle, Vice President Joe Biden, Israeli ambassador Michael Oren and Supreme Court Justice Ruth Bader Ginsburg. 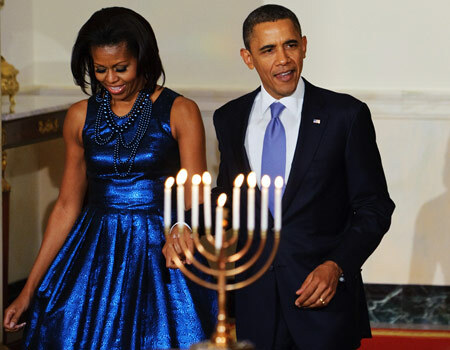 “The story of Hanukkah is one of right over might, of faith over doubt,” he remarked. Franklin Delano Roosevelt was the first great communicator, the first president to seize the intimacy of radio to talk to Americans one to one. His most famous address came seventy years ago today — one day after the attack on Pearl Harbor — and it went out on this very radio station. “Yesterday, December 7th, 1941 – a date which will live in infamy. The United States of America was suddenly and deliberately attacked by naval and air forces of the empire of Japan,” Roosevelt told a joint session of Congress. But for this address, it was a cold reality that FDR needed to convey. “No matter how long it may take us to overcome this premeditated invasion, the American people in their righteous might will win through to absolute victory,” FDR continued. This morning, Senate Republicans blocked the confirmation of Richard Cordray. Shortly after, President Obama walked into the briefing room here at the White House to address that vote — and the refusal of Congress to extend the payroll tax cut. This individual’s job is to make sure that individual consumers are protected — everybody from seniors to young people who are looking for student loans, to members of our Armed Services who are probably more vulnerable than just about anybody when it comes to unscrupulous financial practices. President Obama promised to explore all options and take nothing “off the table” with respect to ensuring that the CFPB is able to fulfill its mission of protecting consumers. This is for 160 million people who, in 23 days, are going to see their taxes go up if Congress doesn’t act. This is for 5 million individuals who are out there looking for a job and can’t find a job right now in a tough economy who could end up not being able to pay their bills or keep their house if Congress doesn’t act. 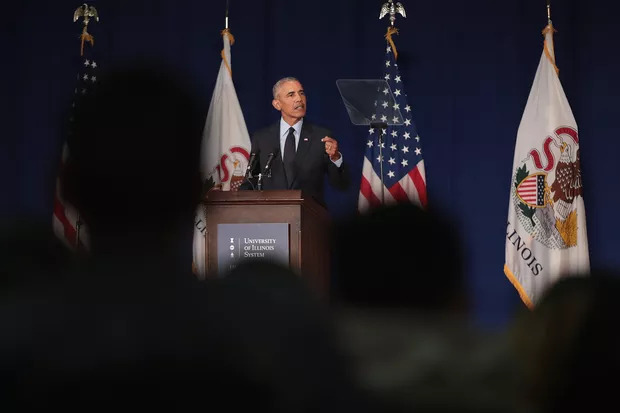 “Rather than trying to figure out what they can extract politically from me, what they need to do is focus on what’s good for the economy, what’s good for jobs, and what’s good for the American people.” President Obama said. THE PRESIDENT: Good morning, everybody. A couple of days ago I said that we are in a make-or-break moment when it comes to America’s middle class. We either have a country where everybody fends for themselves, or we create a country where everybody does their fair share, everybody has got a fair chance, and we ensure that there’s fair play out there. Now, we have nominated somebody — Richard Cordray, former attorney general and treasurer of Ohio — who everybody says is highly qualified. The majority of attorney generals, Republican and Democrat, from across the country have said this is somebody who can do the job with integrity, who has a tradition of being a bipartisan individual who looks out for the public interest, and is ready to go. And he actually helped set up the Consumer Finance Protection Board. So I just want to send a message to the Senate: We are not giving up on this. We’re going to keep on going at it. We are not going to allow politics as usual on Capitol Hill to stand in the way of American consumers being protected by unscrupulous financial operators. And we’re going to keep on pushing on this issue. Now, the second thing I want to make clear about is that, with respect to the payroll tax — you guys have all seen our countdown clock behind us. This is about doing — making sure that everybody is doing their fair share and that the middle class does not see their taxes go up by $1,000 in 23 days. And we’ve heard recently some intimations from the Senate Majority Leader and from the Speaker of the House — or the Senate Minority Leader and the Speaker of the House that they think we should do a payroll tax, but the question is what price will they extract from the President in order to get it done. And I just want to make clear: This is not about me. They shouldn’t extend the payroll tax cut for me. They shouldn’t extend unemployment insurance for me. This is for 160 million people who, in 23 days, are going to see their taxes go up if Congress doesn’t act. This is for 5 million individuals who are out there looking for a job and can’t find a job right now in a tough economy who could end up not being able to pay their bills or keep their house if Congress doesn’t act. So rather than trying to figure out what can they extract politically from me in order to get this thing done, what they need to do is be focused on what’s good for the economy, what’s good for jobs and what’s good for the American people. With that, I’m going to take a couple of questions. Ben. Q Thank you, Mr. President. It’s a very busy time. If I may, I’d like to ask you about two other important issues in the news. Republican candidates have taken aim at your approach to foreign policy, particularly the Middle East and Israel, and accused you of appeasement. I wanted to get your reaction to that. And also, I’m wondering if you personally intervened in any way in halting the sale of the “morning after” pill to those under 17, and whether you think politics trumps science in this case. THE PRESIDENT: Ask Osama bin Laden and the 22-out-of-30 top al Qaeda leaders who’ve been taken off the field whether I engage in appeasement. Or whoever is left out there, ask them about that. I will say this, as the father of two daughters. I think it is important for us to make sure that we apply some common sense to various rules when it comes to over-the-counter medicine. And as I understand it, the reason Kathleen made this decision was she could not be confident that a 10-year-old or an 11-year-old go into a drugstore, should be able — alongside bubble gum or batteries — be able to buy a medication that potentially, if not used properly, could end up having an adverse effect. And I think most parents would probably feel the same way. So the expectation here is — I think it’s very important to understand that, for women, for those over 17, this continues to be something that you can go in and purchase from a drugstore. It has been deemed safe by the FDA. Nobody is challenging that. When it comes to 12-year-olds or 13-year-olds, the question is can we have confidence that they would potentially use Plan B properly. And her judgment was that there was not enough evidence that this potentially could be used improperly in a way that had adverse health effects on those young people. Q Mr. President, is a recess appointment for Richard Cordray on the table, number one. And number two, the Italian Prime Minister, the new Prime Minister indicated today he may be coming to the White House next month. Do you think he and other European leaders are stepping up in the way you’ve urged them to, to sort of clear up the debt crisis? I don’t think there’s any consumer out there — I don’t think there’s any American out there — who thinks that the reason we got into the big financial mess that we did was because of too much regulation of Wall Street or the financial services industry. I take it back. I’m sure there are some folks in the financial service industry who make that argument, although I’m not sure that they make it with a straight face. So let’s just take a very specific example: All the families out there who have now lost their home, after having paid their mortgage over and over again, because they were told that they could afford this home; they didn’t understand all the documentation that was involved — this was peddled deliberately to them, even though a mortgage broker might have known that there was no way that they could keep up with these payments — and now they’re out on the street because nobody was making sure that there’s fair play and fair dealing in the mortgage industry on it. Now, why wouldn’t we want to have somebody just to make sure that people are being treated fairly? Especially when not only is that family affected, but our whole economy is affected. We had Holly Petraeus, wife of General Petraeus, who’s been working to make sure that our Armed Services personnel aren’t taken advantage of. They get transferred to a base, and next thing they know they’re taking out loans that they think are a good deal, but it turns out that they’re paying 100-150-200 percent interest rates. Why wouldn’t we want somebody in place to make sure that doesn’t happen? It doesn’t make any sense. So the bottom line is — you asked about the recess appointment — we’re going to look at all our options. My hope and expectation is, is that the Republicans who blocked this nomination come to their senses. And I know that some of them have made an argument, well, we just want to sort of make some modifications in the law. Well, they’re free to introduce a bill and get that passed. But part of what’s happened over on Capitol Hill — not just on this issue, but on every issue — is they will hold up nominations, well-qualified judges aren’t getting a vote — I’ve got assistant secretaries to the Treasury who get held up for no reason, just because they’re trying to see if they can use that to reverse some sort of law that’s already been passed. And that’s part of what gets the American people so frustrated — because they don’t feel like this thing is on the level. THE PRESIDENT: Oh, on the European debt crisis — I am obviously very concerned about what’s happening in Europe. I’ve expressed those concerns repeatedly to President Sarkozy, Chancellor Merkel, all the key leaders involved. I think they now recognize the urgency of doing something serious and bold. The question is whether they can muster the political will to get it done. Look, Europe is wealthy enough that there’s no reason why they can’t solve this problem. It’s not as if we’re talking about some impoverished country that doesn’t have any resources, and is being buffeted by the world markets, and they need to come hat in hand and get help. This is Europe, with some of the wealthiest countries on Earth; collectively one of the largest markets on Earth, if not the largest. And so if they muster the political will, they have the capacity to settle markets down, make sure that they are acting responsibly, and that governments like Italy are able to finance their debt. And I think that Chancellor Merkel has made some progress with other European leaders in trying to move towards a fiscal compact where everybody is playing by the same rules and nobody is acting irresponsibly. I think that’s all for the good, but there’s a short-term crisis that has to be resolved to make sure that markets have confidence that Europe stands behind the euro. And we’re going to do everything we can to push them in a good direction on this, because it has a huge impact on what happens here in the United States. They are our largest trading partner, and we’re seeing some positive signs in our economy, but if we see Europe tank, that obviously could have a big impact on our ability to generate the jobs that we need here in the United States. I’m going to answer one last question. Kristen — Kristen Welker. And also, on Iran, we’ve heard some sharper language from members of your administration about Iran recently. Are you intentionally trying to ramp up the pressure on Iran? And given that you stated that no options are off the table, should we take that to mean that you are considering some other options? THE PRESIDENT: No. But what I can say with respect to Iran, I think it’s very important to remember, particularly given some of the political noise out there, that this administration has systematically imposed the toughest sanctions on Iraq — on Iran ever. When we came into office, the world was divided, Iran was unified and moving aggressively on its own agenda. Today, Iran is isolated, and the world is unified in applying the toughest sanctions that Iran has ever experienced. And it’s having an impact inside of Iran. And that’s as a consequence of the extraordinary work that’s been done by our national security team. Now, Iran understands that they have a choice: They can break that isolation by acting responsibly and foreswearing the development of nuclear weapons, which would still allow them to pursue peaceful nuclear power, like every other country that’s a member of the Non-Proliferation Treaty, or they can continue to operate in a fashion that isolates them from the entire world. 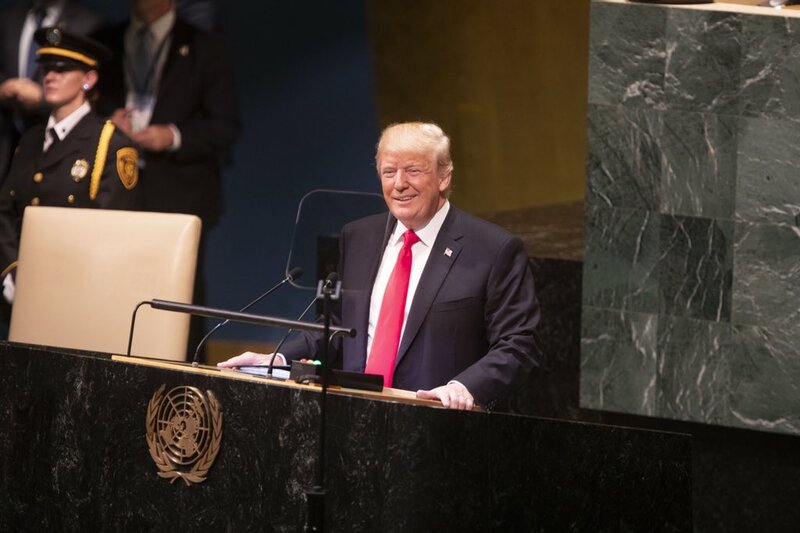 And if they are pursuing nuclear weapons, then I have said very clearly, that is contrary to the national security interests of the United States; it’s contrary to the national security interests of our allies, including Israel; and we are going to work with the world community to prevent that. With respect to my vacation, I would not ask anybody to do something I’m not willing to do myself. So I know some of you might have been looking forward to a little sun and sand — (laughter) — but the bottom line is, is that we are going to stay here as long as it takes to make sure that the American people’s taxes don’t go up on January 1st, and to make sure that folks who desperately need unemployment insurance get that help. And there’s absolutely no excuse for us not getting it done. Keep in mind, on the payroll tax cut, this is something that Democrats and Republicans agreed to last year with little fanfare, and it was good for the economy. And independent economists estimate that for us to not extend it right now — to not extend payroll tax cut, not extend unemployment insurance — would have a significant, adverse impact on our economy, right at a time when we’re supposed to be growing the economy. I know the suggestion right now is, is that somehow, well, this Keystone issue will create jobs. That’s being determined by the State Department right now, and there is a process. But here’s what I know: However many jobs might be generated by a Keystone pipeline, they’re going to be a lot fewer than the jobs that are created by extending the payroll tax cut and extending unemployment insurance. Get it done. And if not, maybe we’ll have a white Christmas here in Washington. And I look forward to spending a lot of time with you guys — (laughter) — between now and the New Year. Senate Republicans Block Obama Pick to Lead Consumer Panel: The Senate blocked President Obama’s nominee to head the Consumer Financial Protection Bureau, as filibustering Republicans who oppose the very powers of the new agency successfully challenged one of the administration’s main responses to the financial crisis. The nomination of Richard Cordray was rejected after Democrats failed to achieve the 60 votes they needed to move his nomination forward. The vote was 53 yes, 45 no. Senate Republicans block Obama’s nominee to head consumer watchdog agency: In a long-awaited vote Thursday morning, Senate Republicans blocked the confirmation of President Obama’s nominee to lead his signature consumer watchdog agency, a move that prevents it from exercising many of its broad new powers.